Provided visual and UX design for The Washington Post National Edition, released first on Kindle. 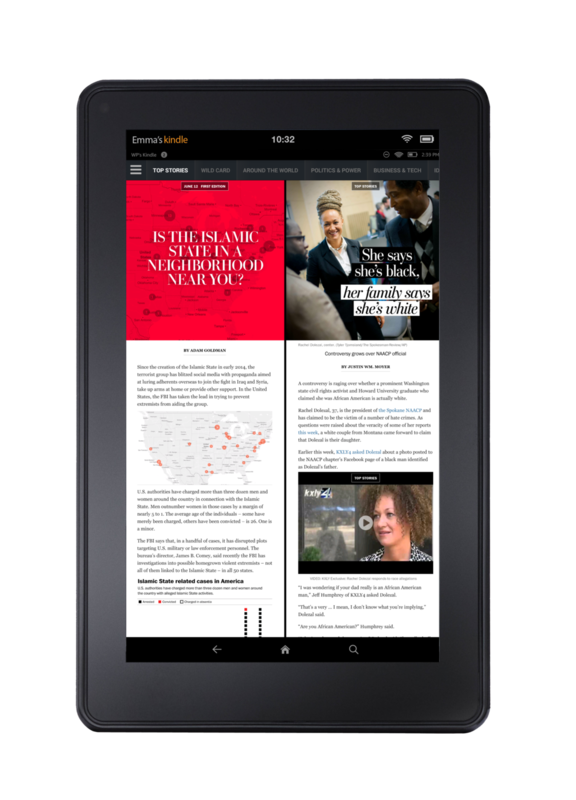 Created an Android-first UI and visual design for The Post’s National App for Kindle. Collaborated on an agile team to sketch, create wireframes and produce high fidelity designs for the tablet-first app’s interface. Designed article templates and system of “brights”, or highly-visual panels created by visual designers and app producers to be feature images for the app’s top stories. Worked with the team of designers to establish creation process and workflow, and maintain updates to templates. The team set out to create a reader app for tablet that limited the "cognitive overhead" of choosing a story amid the tens or hundreds of options on a homepage or other reader apps. Instead, we emphasized choosing between two stories, and providing bold visuals and elegant typography to sell our award-winning content to a broader audience. The app launched pre-downloaded on all Kindles, and provided a built-in user base. Amazon also afforded us the edge of being able to update our "tile" icon on the Kindle home screen daily, which bumped our app logo to the top of the queue. Because of this, we've had a very strong dedicated readership especially on the initial Kindle platform. Worked with research and analytics teams to conduct in-person user testing. Acquired qualitative feedback and researched areas for future feature and growth opportunities. Worked in an agile environment with daily scrums and design check-ins. Collaborated closely with developers at every step of integration: from initial conversation, to rough sketch, to Sketch wireframe, to basic InVision prototype, to more refined Keynote or Pixate prototype to handoff phase.